When Bruloot opened Cocodrillo in 1984 with his partner Eddy Michiels, it was with the sole intention of showcasing pieces that excited them. “It had to be a business, but the business came second,” he explains, “The first reason for opening it was to show the people what we liked; we are not businessmen, we are thrilled by things and we want to show them off.” And it is this attitude, this seemingly boundless enthusiasm for design and the avant-garde that established Bruloot and Michaels as two men who really did change the footprint of fashion. So, when Martin Margiela turned up at their first, six metre by six metre store in Antwerp, they went to his apartment the very same evening and immediately bought stock. "My inspiration was still very ‘academic’ in those days." 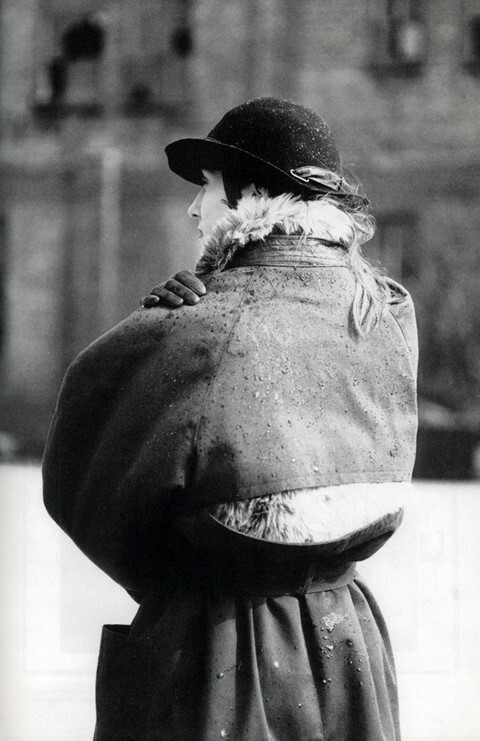 Margiela explained to Bruloot earlier this year, in a rare interview for the book that accompanies the new show. "Very British, 1900s, masculine shoe styles on feminine lasts, with high heels that looked chunky seen from the side and quite narrow seen from the back. The chosen leather, assembly and finishing were as those used in traditional footwear for men." And one of the very first customers who came into buy them was designer Ann Demeulemeester. “She was unknown back then," remembers Bruloot, "but there was another store in the same shopping mall that Dirk Van Saene owned, called Beauties and Heroes. Walter Van Beirendonck was Dirk’s boyfriend, so he would come by, and little by little we all got to know each other.” By this stage, Margiela was working under Jean Paul Gaultier, and by the time he showed his first collection, in 1989, Bruloot had opened Louis, a store that exclusively retailed the collective of Belgian designers who soon became known as the Antwerp 6. "Margiela drenched his models in red paint, so that the unusual footprints they left behind were clearly visible on the white catwalk"
Worn on the feet of the models at that very first show were the shoes that have become one of fashion’s most recognizable footprints: Margiela’s interpretation of the split-toed Japanese tabi sock, the Tabi boot. In fact, Margiela drenched his models in red paint, so that the unusual footprints they left behind were clearly visible on the white catwalk; as he told Brulot, "I thought the audience should notice the new footwear. And what would be more evident than its footprint?" 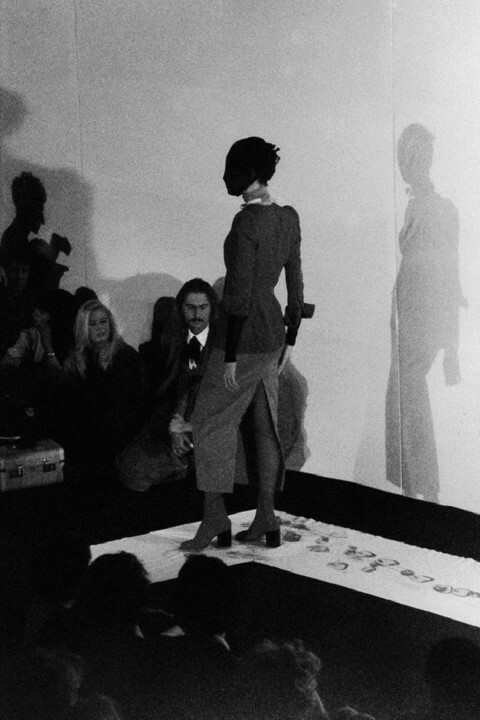 Margiela later turned this first, stained runway – decorated with the steps of the models – into a waistcoat which became the opening look of his next (A/W89) show, held together by brown scotch tape. Ever since, the Tabi shoe has become one of the most iconic pieces of all time. "I wanted to create an ‘invisible’ shoe, the illusion of a bare foot walking on a high, chunky heel," Margiela told Brulot; but its recurrence within his collections was initally borne of necessity. "In the beginning there was no budget for a new form, so I had no other choice than to continue with [the Tabi style] if I wanted shoes. But after several collections people started asking for them. And they wanted more… and they didn’t stop asking, thank God!" In fact, it was literally the same shoes that were used in the S/S90 collection; as Margiela explained, "Because we could not afford new shoes, I put wall paint over my first collection to give it the same new feel as we did with everything else in our showroom." 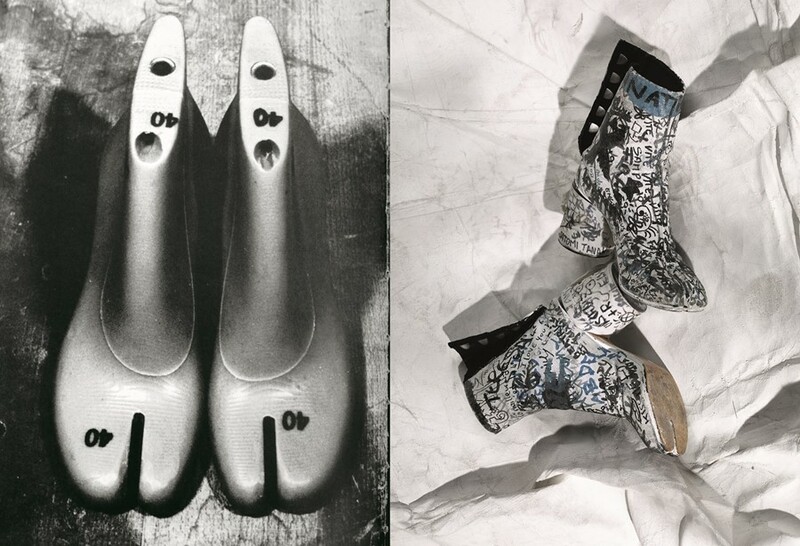 It was Bruloot himself who introduced Margiela to the man who facilitated the production of the Tabi boot: Mr Zagato, a man whose career had previously been responsible for the production of Tokio Kumagai’s collections. Kumagi has died the year before and, as Bruloot explained, "he didn’t have a real job anymore; he was only producing some small things and he thought of quitting the production of shoes. We had a dinner together and I said, wouldn’t you be interested in producing some shoes for our friend Martin Margiela – but he didn’t know who he was. We took a boot out of our bag and put it on the table and we could see Mr. Zagato’s eyes light up. He said, 'Wow! Yes, this I want to do!'" And this is the impact the Tabi seems to have; people light up and speak fervidly about it with a strange passion that's often forgotten when it comes to shoe design. It is the footprint that decorates the cover of Bruloot's show catalogue, it has been turned into boots with plexiglass heels, into plimsolls and wooden clogs ("the most extreme version was a pair of soles on high heels, sold with a roll of transparent scotch tape to attach them to your feet," explains Margiela). “When we started this project, Eddy asked, 'what is the most important foot print of your career?' After a short while I said, “it’s the Tabi boot.” It’s recognisable and it has been there for more than 25 years now – it's there, and it still goes on, and it has never been copied. It’s an incredible story." See the Tabi boot in all its glory, alongside pioneering shoe designs by Jurgi Persoons, Prada, Raf Simons and more in Footprint – The Track of Shoes in Fashion at MoMu Antwerp from 3 September 2015 until 14 February 2016.